Well today's the day. It's 01:00 and having had a quick wash and checked over the vehicle we set out for the city of Istanbul. The Satnav was already on, I left it turned on the whole time we were parked up for fear I wouldn't find my way around the menu again. It was motorway much of the way, or rather a toll road and when we reached the end of it we realised there was nobody to pay the fee to. We later learned it was all done by number plate recognition paid by prepaid cards, so we'll probably get a fine for that and to top it all we narrowly missed a huge pothole on the way in. It must have been about 15-18" across and about 6" deep. If we'd hit that it would have destroyed the tyres and suspension. Now down in to the great metropolis of Istanbul, as expected there was very little traffic about. I've dropped my speed right down. I then realise that the volume on the Satnav didn't get saved at its highest setting as I'd wanted, and found myself leaning forward to hear what ‘He' is telling me to do. At the same time as leaning forward I'm noticing that not only is it dual carriageway but the nearside one is the bus lane - and I'm in it. Sugar, probably more fines on the way, but at the speed I'm travelling the motorists behind me would have been less than happy if I'd changed lanes. Sometimes the satnav graphics weren't too clear as to what I should be doing, but at each stage it seemed to work out ok. We were heading for the Municipality Football Sports Court, Kennedy Caddesi (Avenue), Fatih, Kumkapi. I had the exact latitude and longitude written down for it but hadn't had time to work how to punch that in to the Satnav, but had a location that was very close to it. Then we hit road works on Kennedy Avenue as we neared our destination, with very lumpy, bumpy, detours. I was fearful the Satnav would tell us we'd arrived and all we would be able to see were concrete barriers etc. Luckily we'd just cleared it all when we were told we had arrived - nothing! We carried on when suddenly I spotted a floodlit artificial football pitch over to our left across a central reservation. With that we did a U turn at the earliest opportunity and arrived much relieved at about 02:30. Believe it or not they were actually playing football at that time of day. Back home we have the Sunday League, here they must have the Middle-of-the-night League, fortunately for us they have, otherwise we probably wouldn't have noticed the location***. 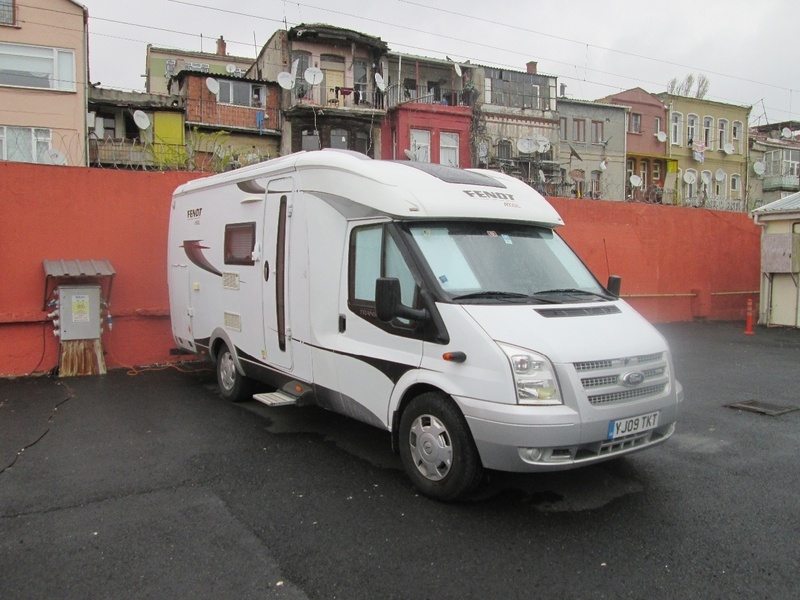 Parked up in the car park next to the pitch with two other motorhomes we were greeted by the manager who showed us the ropes and took our first nights payment of €20, then it was back to bed. I told Rosina I couldn't believe we had actually pulled it off, and we both agreed that without that new Satnav and the benefit of coming in at night we would never have done it. Up a few hours later, with the vehicle spring cleaned and hooked up to the electricity, we decided to have a little wander out; It was later in the day as it had been a bit wet earlier. 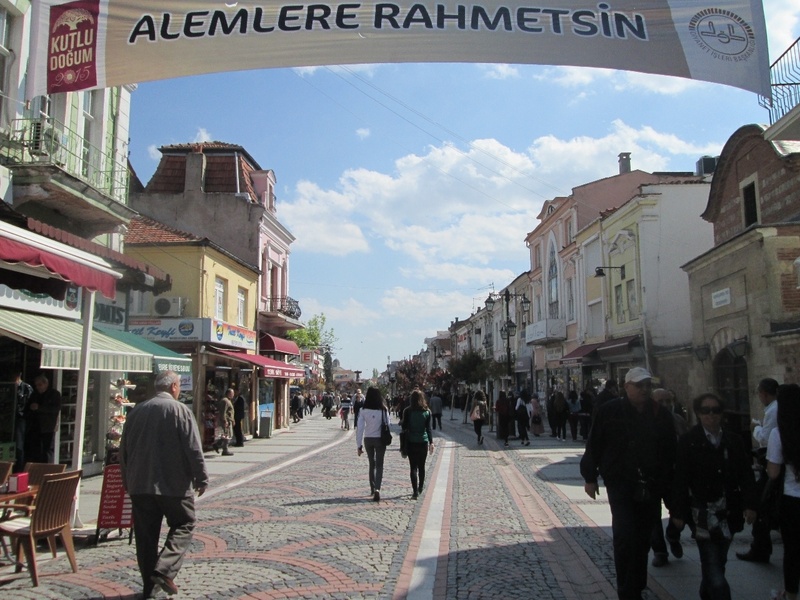 We looked around the Grand Bazaar and took just a few pictures; going out today was really about getting some fresh air and stretching our legs. We're getting used to the noises around us. Outside the car park we have a dual carriageway of traffic congestion. Down the road we have a small mosque and so get the call to prayers wailing away (why they need to do that I don't know, are they aware the alarm clock has been invented? ), we get the yelping of the two puppy dogs owned by the on-site security man who lives in one of the other two motorhomes, and down the road in the other direction we get the amplified passenger broadcasts from a train station. We know this because the electric train line passes right behind our motorhome on the other side of the wall. On the other side of the track is the Mother Theresa slum for retired border staff. Last night was very cold and so I turned the boiler on at 07:00 giving us hot water followed by hot air central heating. The upside of the cold night was that this morning gave us a lovely clear sunny blue sky. Back on the road we headed for Erdine, which is just inside the Turkish border, at which point the plan was to spend a couple of nights at a campground getting ourselves sorted before we headed in to Istanbul itself in the middle of the night to avoid the traffic. The motorway after yesterday’s experiences was much improved. As we approached the Bulgaria/Turkey border we passed a line of HGV's which went on for mile after mile. I think the timescale for a driver joining the back of the queue to finally getting to the front must surely be measured in days not hours. What a game we had getting across the border. It was almost as difficult getting out of Bulgaria as it was getting in to Turkey. Hasn't anybody told these people they have nothing worth taking out of the country, because they haven't got anything! Then in to 'No Man's Land' where there was a Duty Free shop. I pulled over and popped in to enquire if they sold Satnavs with Turkish mapping (our Garmin doesn't have Turkey in it - not even an out of date one). Well even with my explanation of what they were, the staff had never heard of such a thing, they looked at me as if I'd asked for a Flux Capacitor for a DeLorean car. Back onboard I drove over to the Turkish border to present passports, green card insurance and vehicle registration document (we’d only been asked for passports up until now) then drove down to the next kiosk. Passports again – “No Visa? Why no Visa? Must have Visa. Should have got one from British Consulate”. Sugar I thought, I'm sure I read that you bought them at the border. “Pull over there”. He then directed us to where we could buy visas. A long walk to a large building. The left door as directed to was locked, so in through the right door. Staff there look confused when asked for visas, sent us through the building, out the back then directed us to a 'Cash desk' kiosk. “You want visa for London?” “No we want a visa for Turkey”. “You want over there” – pointing to a kiosk a stone’s throw from where our vehicle was parked. So back we went to that kiosk where we purchased two visas for the princely sum of €20 each. What a game that was. I'm sure that little sod in the Passport Control booth does it regularly to visitors for a laugh. Visas attached and some Doner Kebab cash in the back pocket of the border staff we were allowed through, and across the huge concrete complex to another kiosk, this time 'Baggage Control'. “Bar Code? Must have Bar Code”. So back across the complex we drive to be met by another Jobsworth who wanted to search the vehicle. He was especially interested in whether or not we had anybody else in the vehicle (as I recall potential ISIS recruits tend to arrive in comfort courtesy of British Airways etc, not hidden in the back of one of these things), motorbikes and alcohol. I thought I'd better come clean about the boxes of wine, because unless he was blind, he could have tripped over them under the dining table stored there as the rear garage was full. I'd quickly tried to cover them with a copy of last week's Daily Telegraph but failed miserably. Surprisingly for a Muslim country he didn't seem that bothered about the alcohol, just wanted to know how many boxes there were. He gave us a sticky backed bar code to present to 'Baggage Control', no doubt disappointed that he hadn't caught us smuggling in a donkey, a Bulgarian fleeing his own country, motorbike, or rocket propelled grenade, but I'm sure if he's patient enough his day will come. Off then back across the complex where our bar code was scanned and we were allowed to clear the border, and away down the motorway towards Istanbul, about 120 miles ahead. It's Anzac Day on 25th April, the 100th anniversary of the Australian and New Zealand landings at Gallipoli. I hadn't planned to visit the area originally but since we are due to pass fairly close to it I feel it will be worth the detour. The campaign didn't go well for the British and her Allies, which is a shame, because after today I've concluded these Greasy Spiks are long overdue a damn good thrashing. We left the motorway at Edirne, not expecting to ever find the campsite there without Satnav maps or even a paper map with the correct scale. We passed a heaving outdoor market on our right which would have been very interesting to look around, but parking was going to be a big problem. Further up the road we spotted a modern shopping centre over. With a bit of nifty manoeuvring we did a 'U' turn and entered its car park. Soon afterwards we were standing in the Turkish equivalent of ‘Curry's’ where they not only had heard of Satnavs but sold them. I told the lad I needed one with Turkish maps and which would speak directions to me in English. No problem he said and demonstrated a cheap version. That purchased, we treated ourselves to some foreign cuisine - two chicken burgers and fries from Burger King! After lunch we decided to get much closer to Istanbul before parking up in a TruckStop from where we'd strike out for Istanbul tonight. 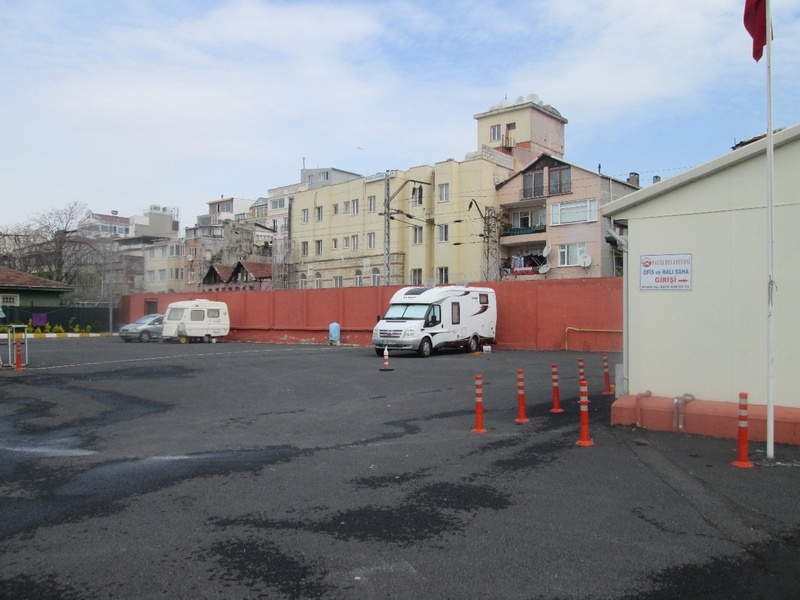 Before leaving town I managed to park the vehicle in a car park on the edge of town so that Rosina could take a look at the Semimiye Mosque, which is supposed to be one of Turkeys finest. I stayed with the vehicle as I would have been really, really, annoyed to have had it stolen when we were just 3 hours drive from Istanbul having come all this way. While I waited for her I tried out the Satnav, eventually selecting the name of the road we wanted in Istanbul and pressing 'GO', or rather it's equivalent. The shop assistant was right it did speak to me in English, however the text on the screen, including the menu settings were still in Turkish, so we're not out of the woods yet. Twenty miles from Istanbul we pulled in to a TruckStop, nothing like as nice as those we'd stopped at before, not even any grass for Truckers to pee over, but it suited our needs. After our evening meal we're grabbing some shut-eye before venturing into Istanbul at about 01:00.